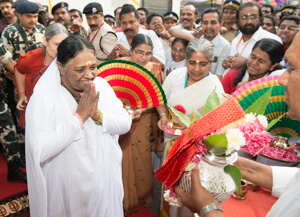 Sixteen years ago Amma visited the city of Vadakara and held a program near the city bus stand. 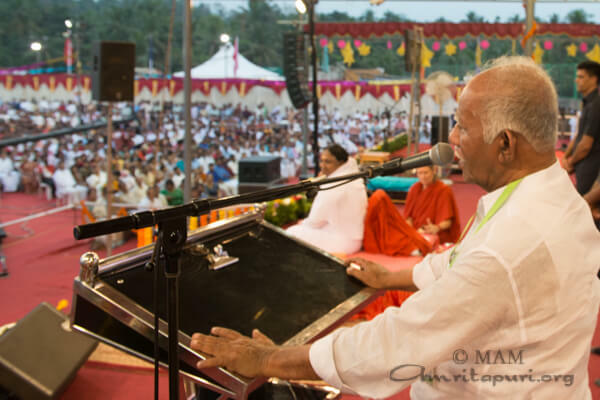 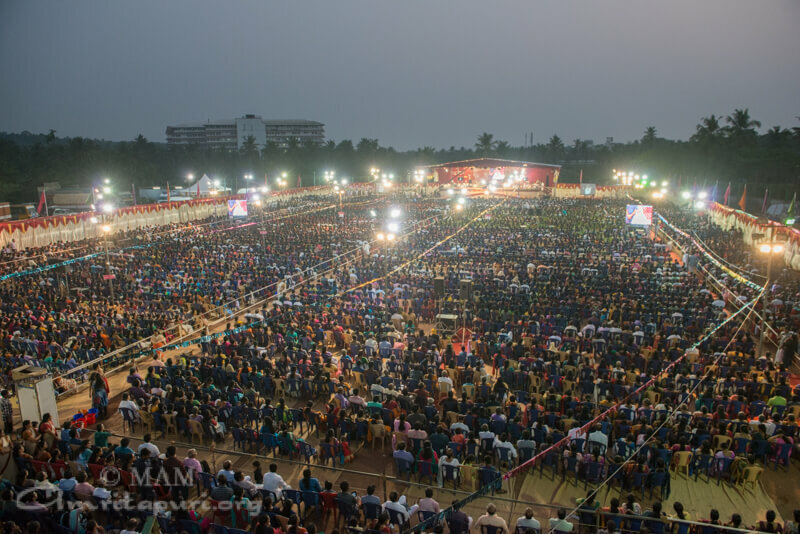 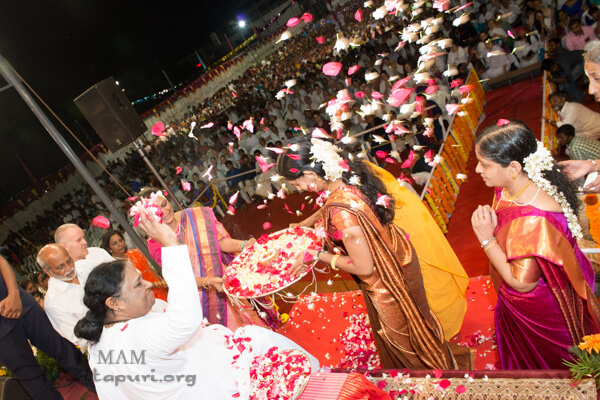 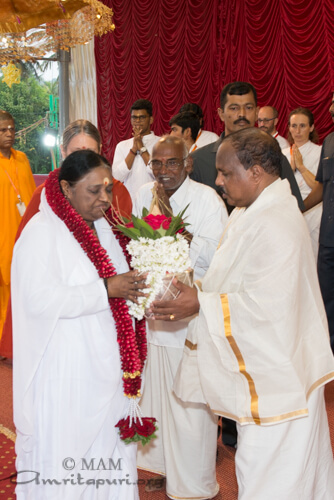 This year Amma returned to hold an evening program in that same location. 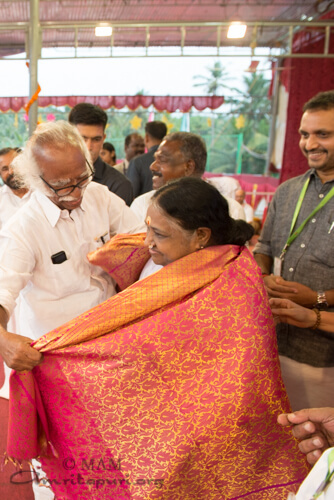 When Amma arrived at the Vadakara program, it was thronging with devotees who came to hear her words and receive the embrace of her darshan. 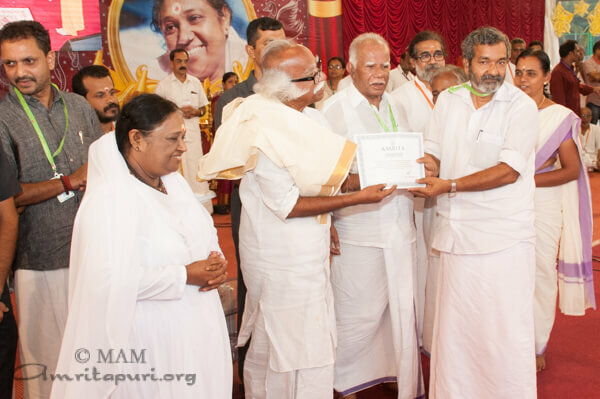 Padmasree Meenakshi Amma Gurukkal; CK Nanu, Vadakara MLA; and Kadannappally Ramachandran Minister of Port and Archeology were also on the stage to greet Amma upon her arrival. 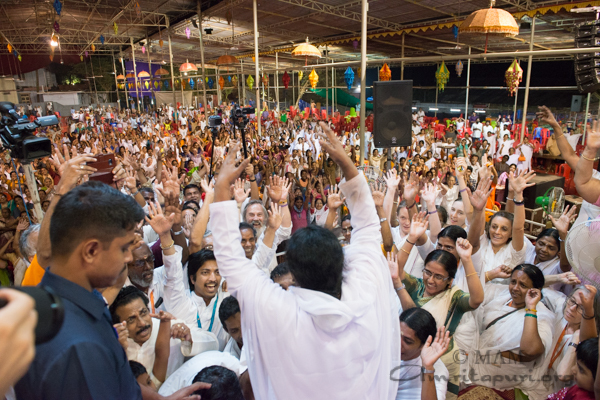 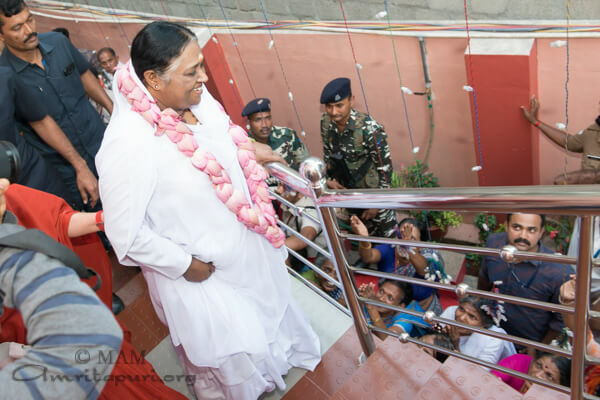 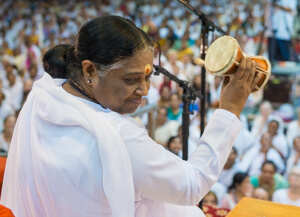 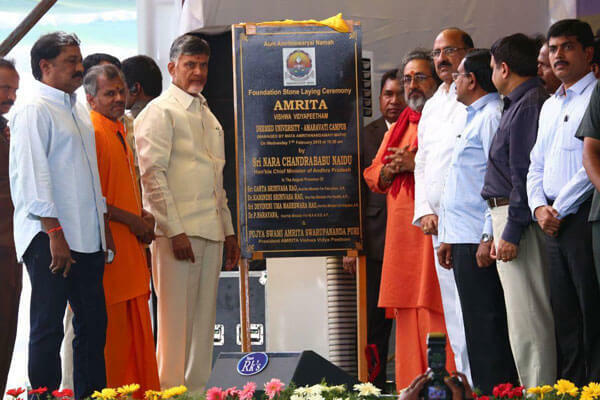 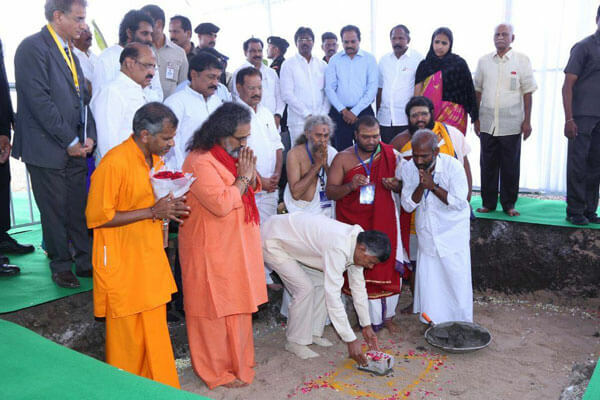 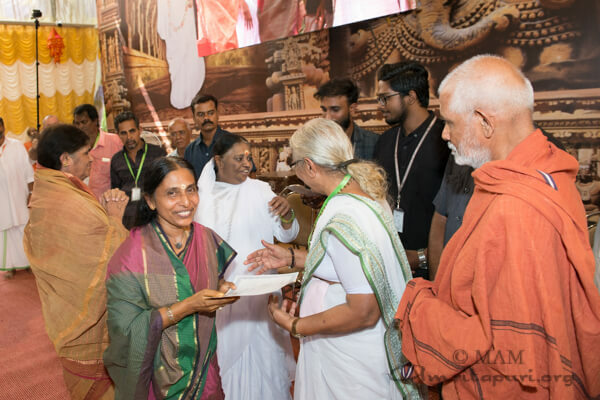 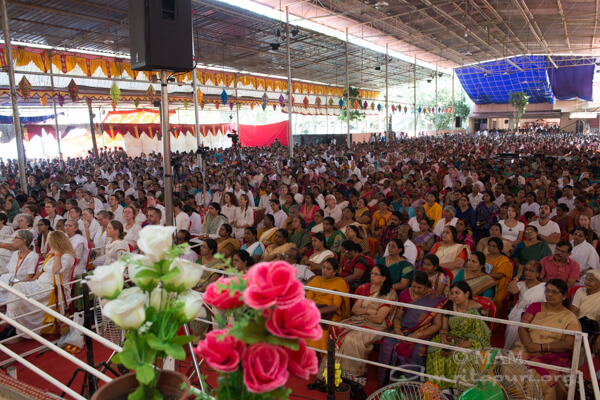 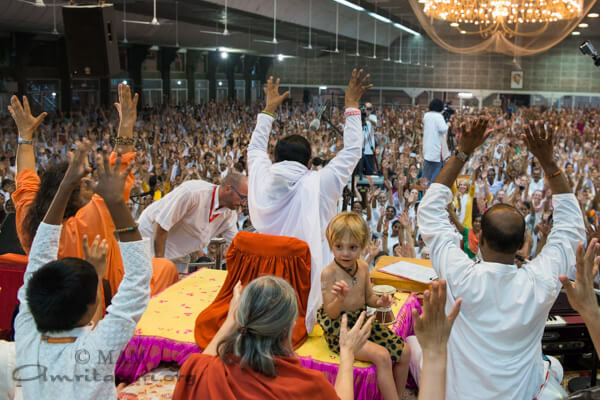 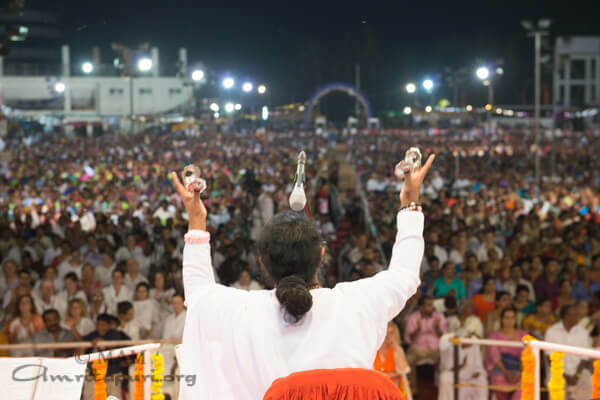 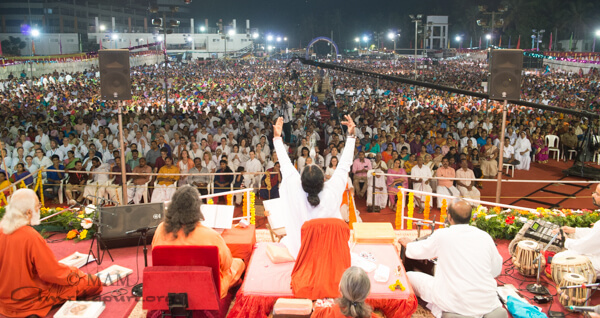 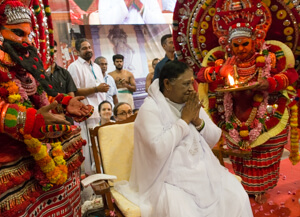 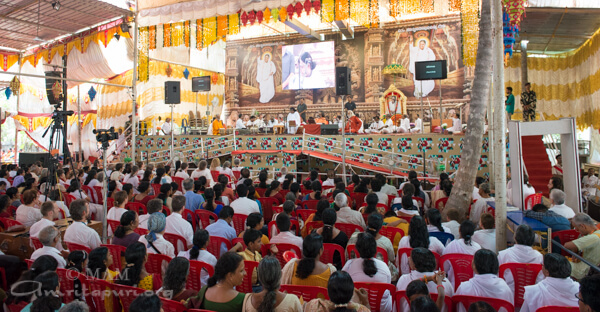 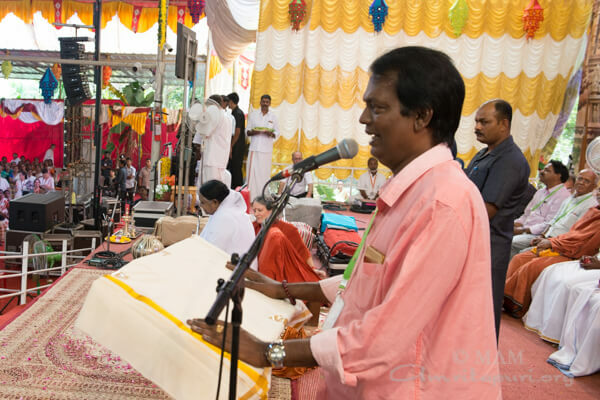 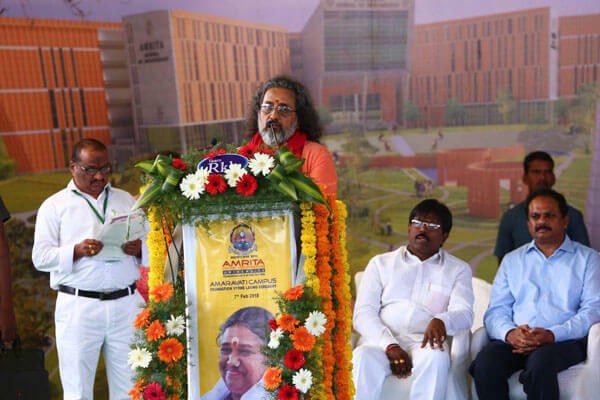 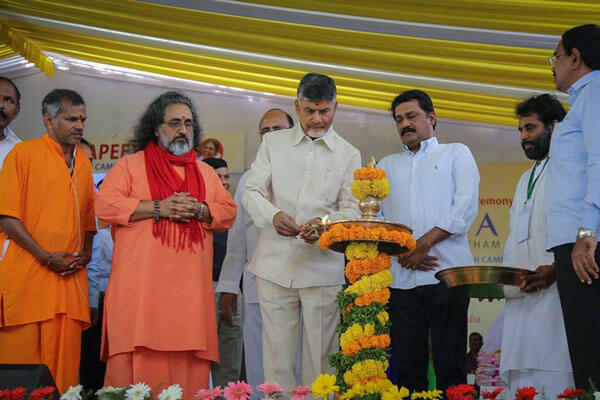 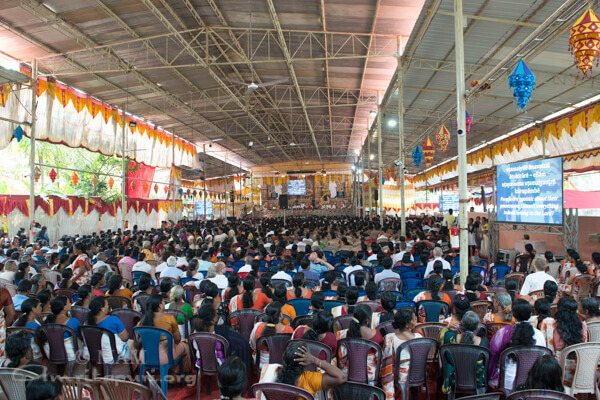 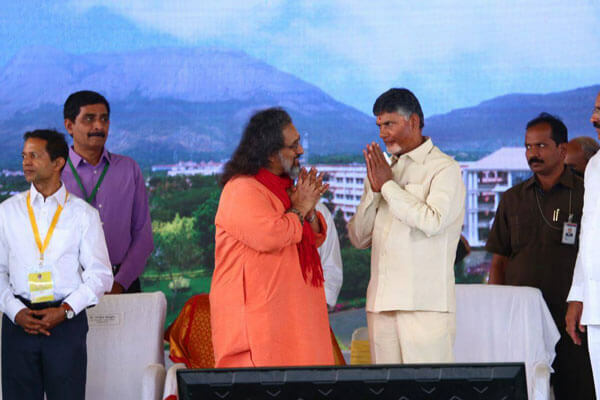 Despite a local bus strike that hindered transportation in the city, the program was swarming with devotees by the time Amma arrived on stage to deliver her talk. 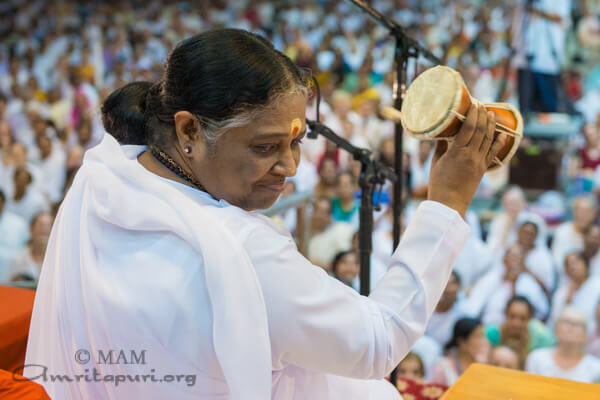 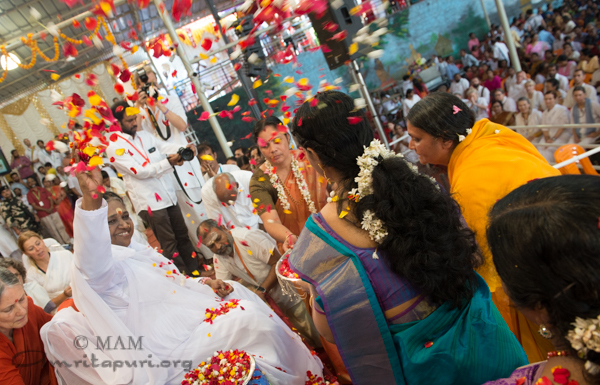 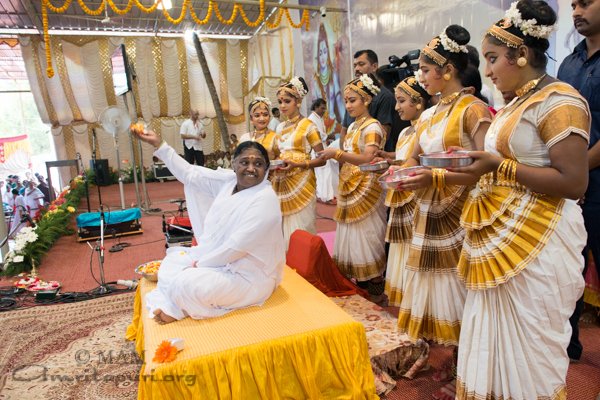 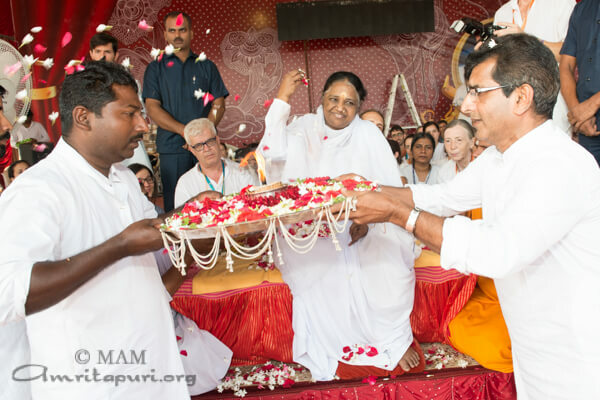 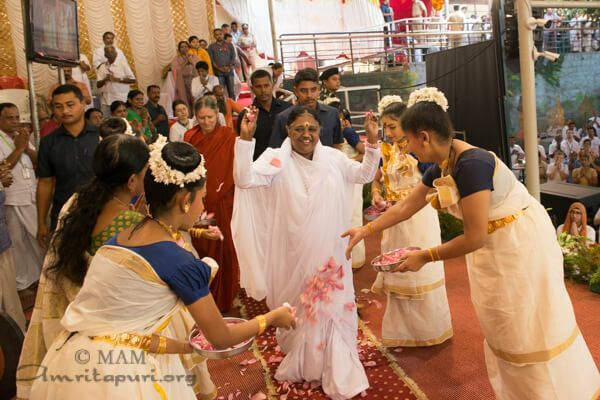 Amma led everyone in a manasapuja and meditation aimed at cultivating compassion in the individual and the world. 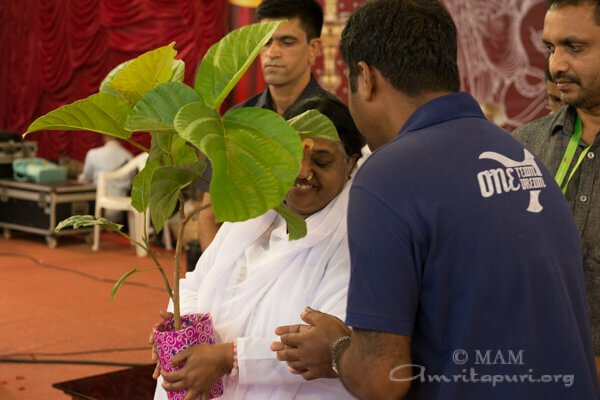 Working capital and saris were gifted to the members to AmritaSREE self-help groups and AYUDH members were given saplings for planting (four different trees which are highly medicinal: Athi, Ithi, Arayal, and Peral) as part of the ‘Nalppamaram Nadinu Nanma’ program. 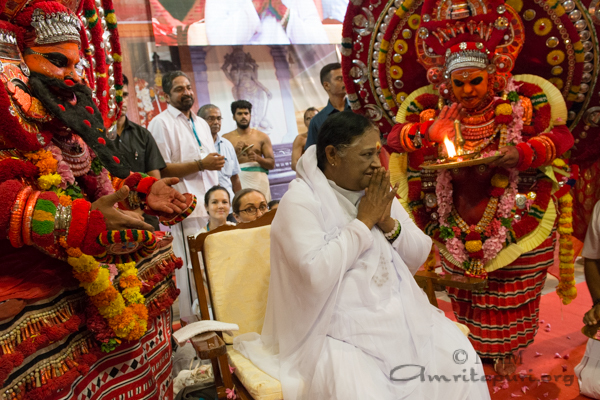 Darshan went all although the night until 8:40 AM the next morning, at which point Amma parted with devotees of Vadakara and headed to Mangalore for the next stop of the 2018 Bharata Yatra. 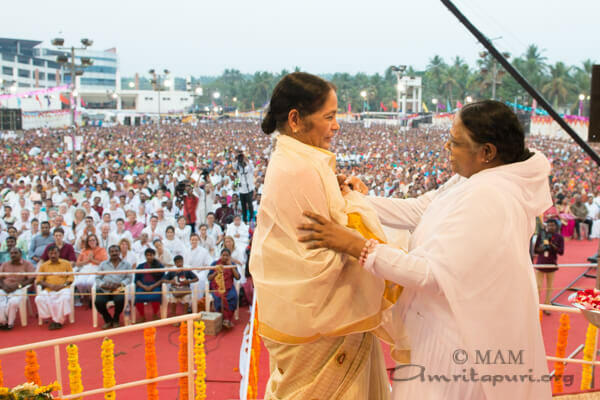 Amma arrived in Kodungallur for a two-day Brahmasthanam festival. 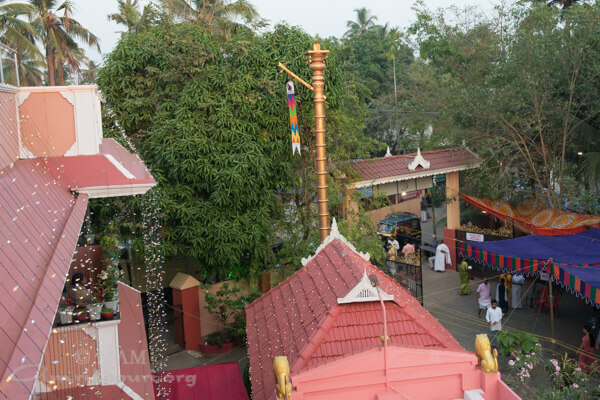 The Kondungallur Brahmasthanam Temple was the first one installed by Amma 30 years ago. 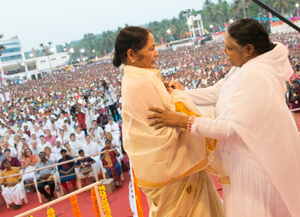 On both days of the festival, Amma delivered a Satsang, sang bhajans, and gave darshan to thousands of devotees eager for her embrace. 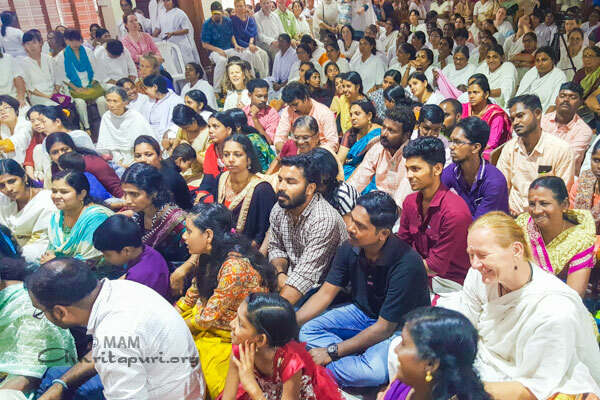 Amongst the attendees were many longtime devotees who have been attending Amma’s Kondungallur program since she first visited 30 years ago. 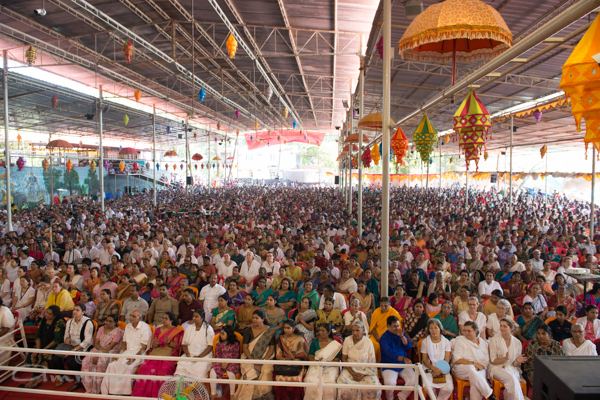 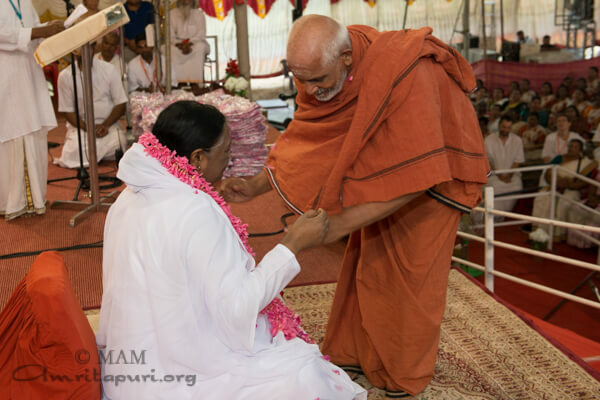 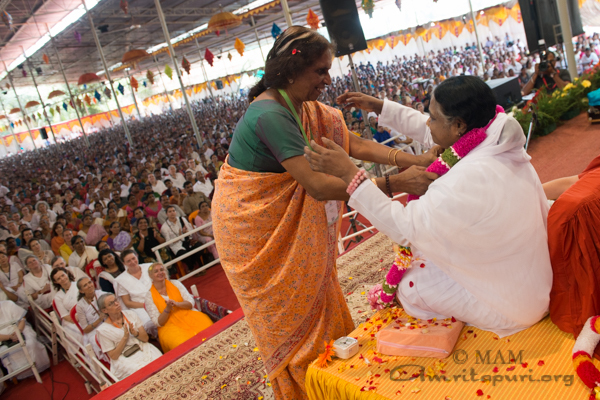 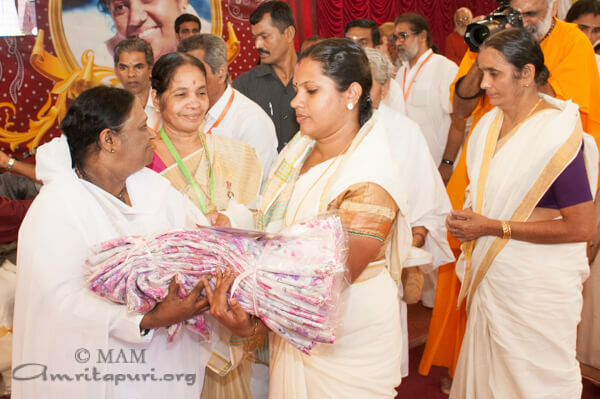 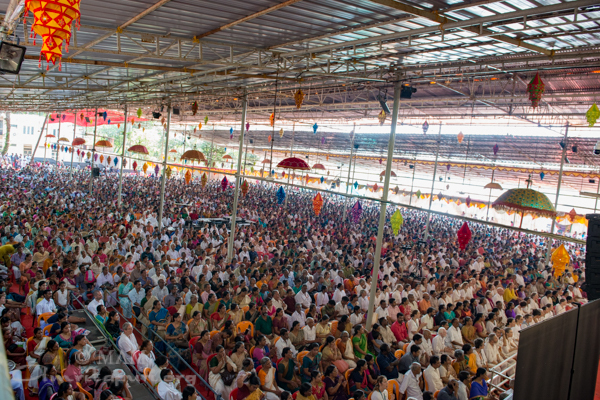 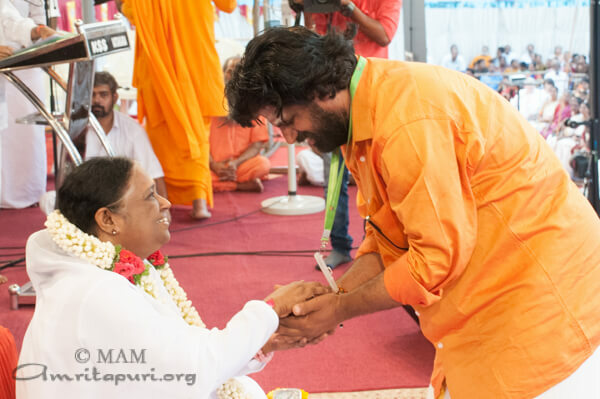 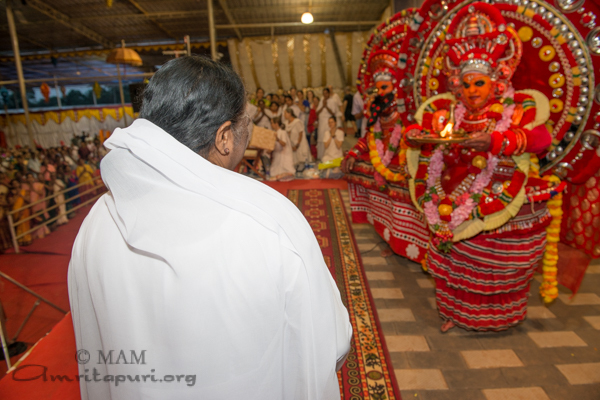 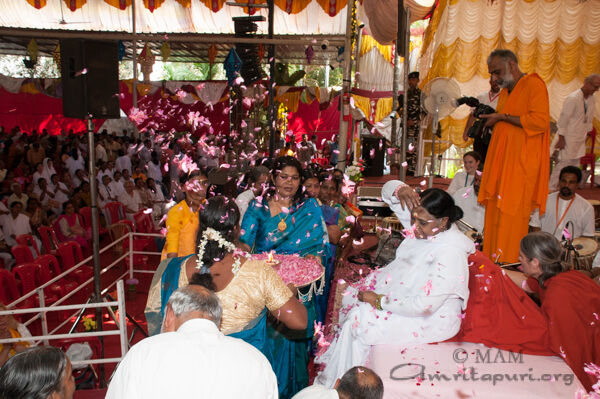 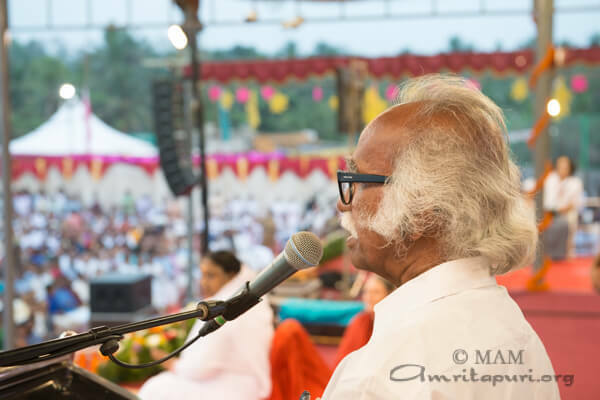 This year though, Amma noticed that some of the eldest devotees were not there, so she inquired as to where they were. 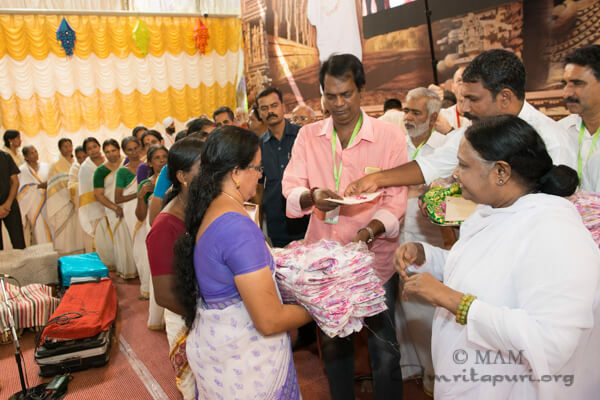 When she heard they could not attend because they were living alone and had no means of transportation, Amma sent drivers to pick them up and give them rides to the program. 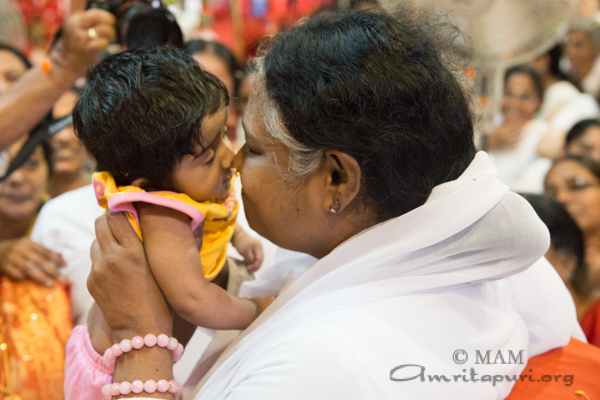 When they arrived, Amma discovered that many were sick, living alone, and had no one to support them. 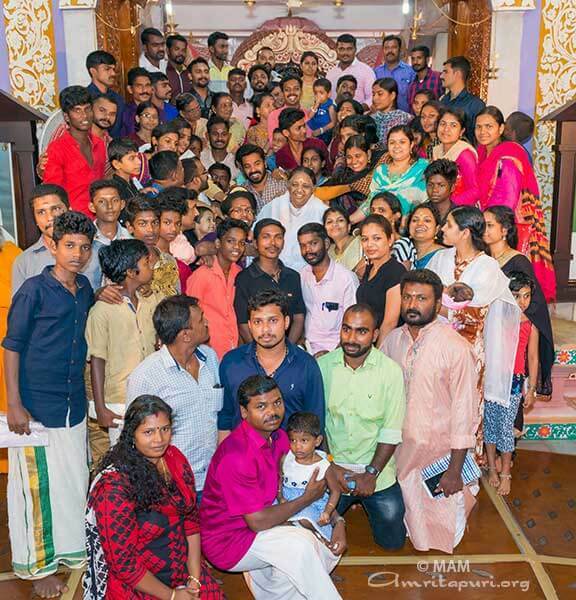 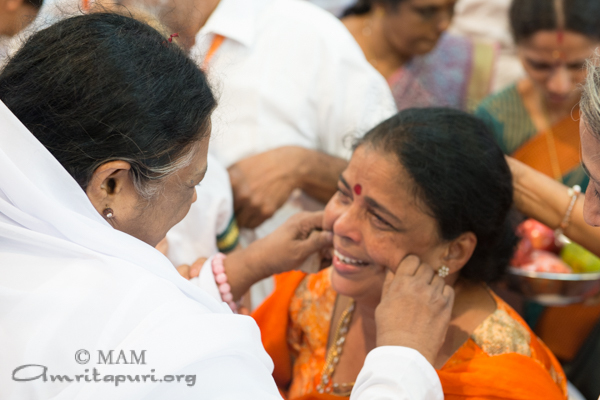 Amma felt their sorrow, comforting them and reiterating that Amma will always be there for them. 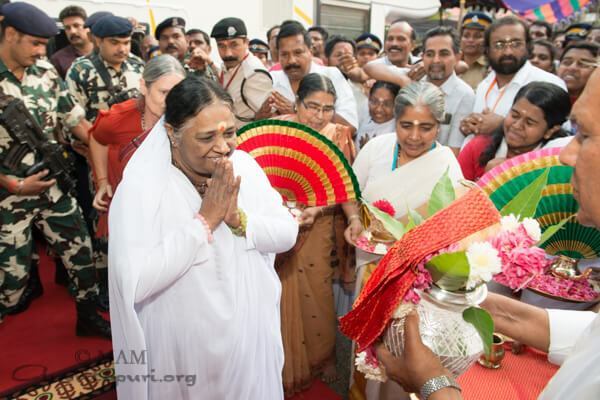 “My surgery for a liver ailment was scheduled at the Amrita hospital. 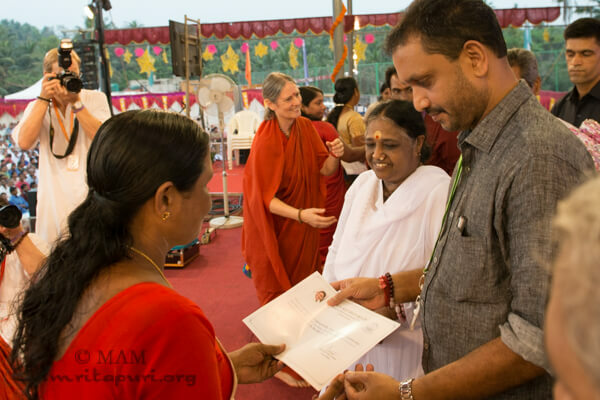 The doctors there advised me to meet Amma as the surgery would be very costly, but being a person with great self-respect I couldn’t imagine myself requesting Amma to help me. 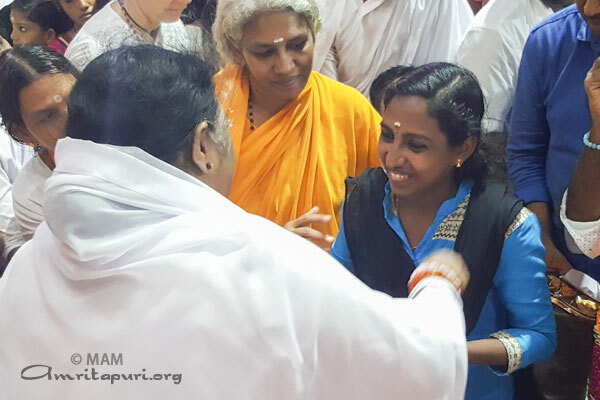 “But I just decided to meet her and went to Amritpauri. 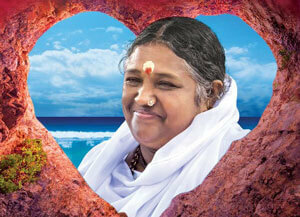 She offered me a seat and asked me why I wanted to see her. 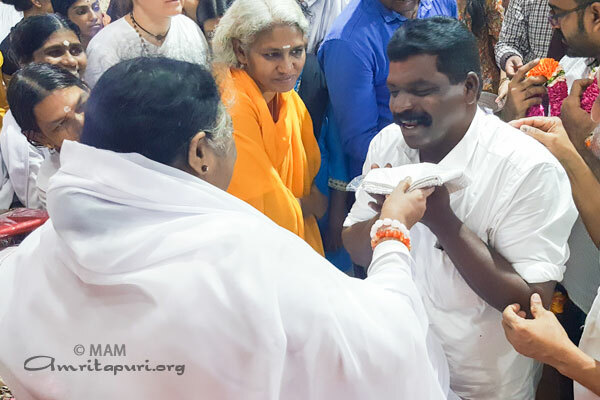 Salim Kumar said that he later thought about the incident and wondered how Amma had been able to understand his need. 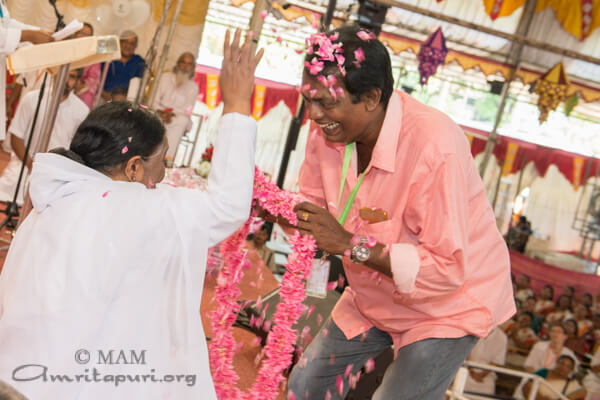 “Every person who meets Amma has a tragic story to tell, and in between those tragic stories I appeared with my comedy.” He said. 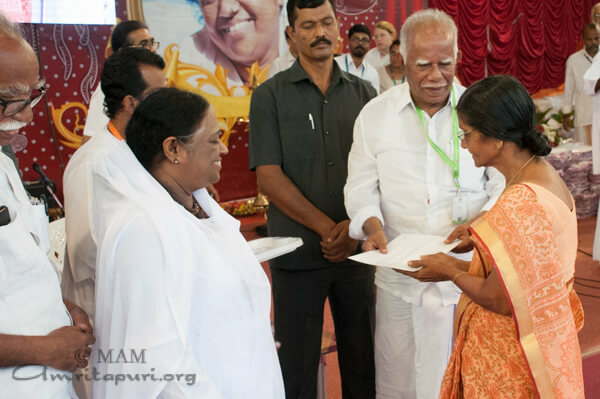 As a gift to the people of Kodungallur, Amma distributed working capital to the AmritaSREE Self-Help Groups. 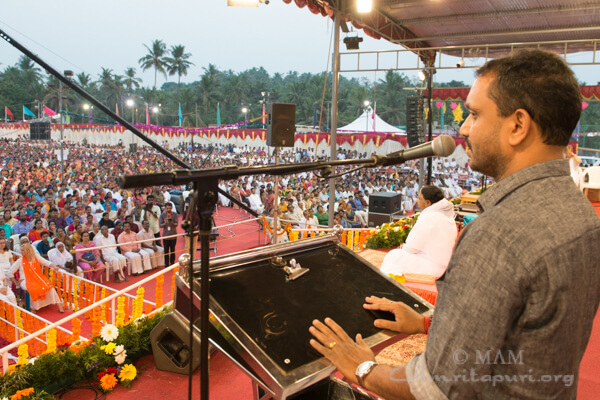 School children of Amrita Vidyalayam also presented various cultural programs during darshan both days. 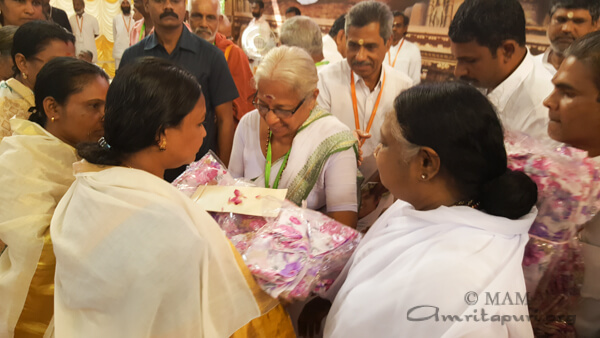 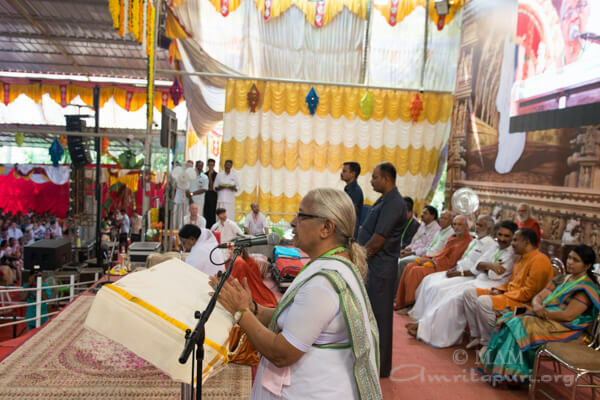 Wrapping up the first leg of the 2018 Bharata Yatra, Amma left Kodungallur to return to Amritapuri.